Hi! My name is Jerry. I am a 10 week old, 3.5 lb. 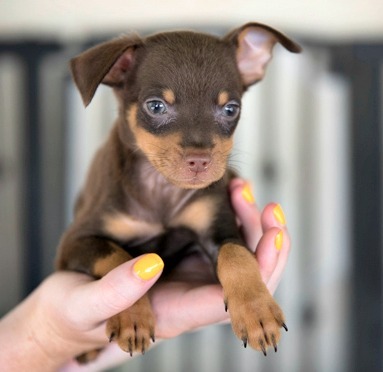 chocolate and tan Miniature Pinscher. I love to explore, play with tiny tennis balls and chew toys. I am a fun-loving guy with an outgoing personality. After play time I like snuggling in your lap to take a puppy nap. I have also started my puppy education learning to walk on a leash and basic commands. My foster family has trained me to go potty outside and I get the hang of that. I will be a small guy who would like a home without small children. 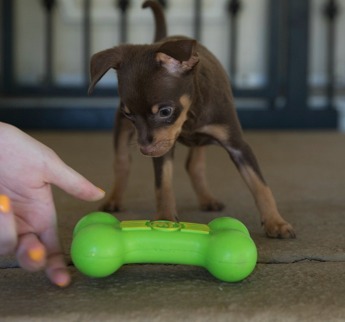 Jerry’s adopters must be willing to enroll him in puppy classes and show proof of attendance. Jerry’s brother Ben is also available for adoption. Jerry would not be suitable for a home where he will be home alone all day. Jerry will be neutered, micro-chipped, and up to date on all shots prior to adoption. 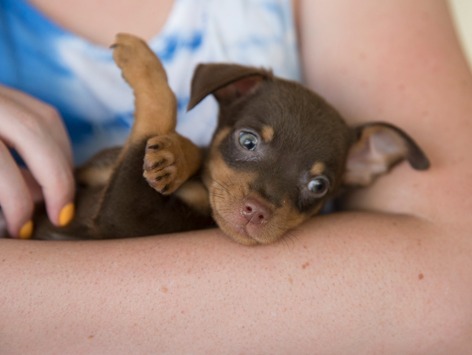 For more information go to www.3rrescue.org or phone 707-529-4643 or email: adopt@3rrescue.org.